A Bluestem Prairie: Walz letter to Ed Secretary Spellings: Why Minnesota? 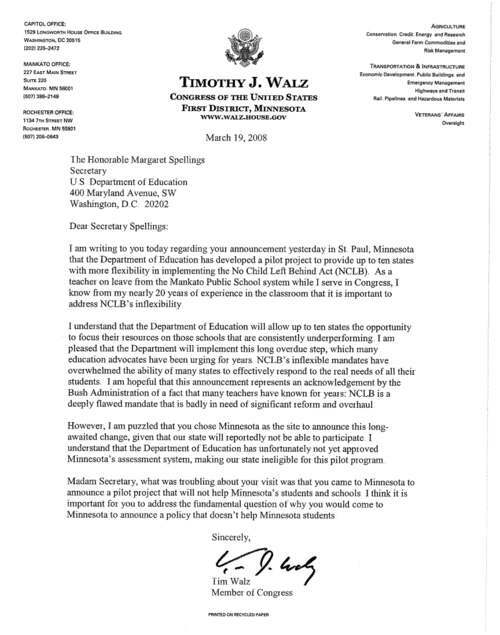 Walz letter to Ed Secretary Spellings: Why Minnesota? Yesterday, with much fanfare, Secretary of Education Margaret Spellings appeared in Minnesota to announce an important new pilot program under No Child Left Behind (NCLB). U.S. Secretary of Education Margaret Spellings was in Minnesota on Tuesday to announce a proposed pilot project for the federal No Child Left Behind law that would give 10 states more flexibility in addressing struggling schools' specific needs. Critics and supporters alike say No Child Left Behind paints with too broad a brush the schools that struggle to show academic improvement. However, Minnesota doesn't yet have enough of those schools to participate in the pilot project, prompting some to question why Spellings made the announcement here and whether it was an effort to help Sen. Norm Coleman in his reelection campaign. Spellings appeared at the state Department of Revenue and the State Capitol alongside Gov. Tim Pawlenty and Coleman. We're guessing that Congressman Walz hears even more about assessment than the typical teacher. His spouse, Gwen, is the assessment coordinator for the Mankato public school system. Here's an image of the letter Walz sent Spellings.